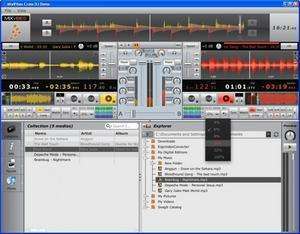 Cross DJ is a very lightweight and free DJing tool which gives newbie DJs or simply beginners some of the popular tools usually required to mix and play music. It features a grey interface with two desks with the display of waveforms on each desk. With that, you can easily picture the two waveforms and how they line up, enabling you to properly and seamlessly mix beats. For each deck, you're given playback controls (like any self-respecting DJ program) and a beats-per-minute count is automatically given to you, making it easy to match up tracks and properly fade them. Version 3.4.0 is a freeware program which does not have restrictions and it's free so it doesn't cost anything. For security reasons, you should also check out the CrossDJ Free download at LO4D.com which includes virus and malware tests. Additional screenshots of this application download may be available, too. CrossDJ Free has a presence on social networks.